Hot on the heels of the compact new E-PACE SUV, Jaguar has just released details on what promises to be its beefiest and most powerful super saloon yet - the XJR575. The new model can hit a lightning top speed of 186mph, and can go from 0-60mph in a swift 4.4 seconds. Not bad for a road worthy saloon, eh? Its 5.0 litre V8 supercharged engine produces 700nm of torque, while the Electronic Active Differential offers control of power delivery and maximises traction. That growling V8 beneath the hood means the XJR575 can hit that 186mph top speed in only 44 seconds. Zoom! This being a British-made Jaguar, the XJR575 doesn't scrimp on the luxury. The model has two new paint options from the firm's Special Vehicle Operations division to ensure the XJR575 is more individual than ever, and there new enhancements to Touch Pro Infotainment system, including a larger 10-inch touchscreen and 4G Wi-Fi. The new saloon also includes intelligent safety measures, such as Autonomous Emergency Braking, Lane Keep Assist and Driver Condition Monitoring, ensuring every drive in the XJR575 is safe as it is exhilarating. 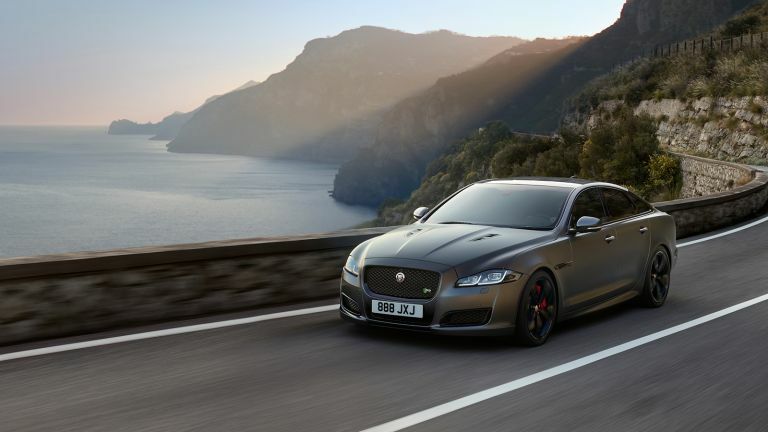 The new Jaguar XJR575 model is available to order now from Jaguar UK retailers, priced from only £93,710 OTR.